BOB DOUGHTY: And I’m Bob Doughty with People in America in VOA Special English. Today we tell about Eunice Kennedy Shriver. She was a member of one of the most famous families in American politics. She used her influence to make a difference in the lives of millions of people. Though she never ran for office, she spent her life energetically working to improve the lives of people with developmental problems. FAITH LAPIDUS: That was Eunice Kennedy Shriver speaking at the nineteen eighty-seven Special Olympics games in South Bend, Indiana. She was a thin and energetic woman with a huge smile and great spirit. Ms. Shriver officially became involved in helping people with developmental problems when she became the executive vice-president of a family organization in nineteen fifty-seven. The Joseph P. Kennedy Junior Foundation was created in nineteen forty-six to honor her oldest brother, who died fighting in World War Two. Under her guidance, the foundation turned its attention to studying the causes of mental disabilities. It also sought to improve the way society treats people with such disabilities. The foundation also started centers for the study of medical ethics at Harvard University and Georgetown University. BOB DOUGHTY: Eunice Shriver and her family had a personal reason to be interested in this issue. Her older sister, Rosemary Kennedy, was born mentally retarded. As Rosemary grew older, she became increasingly difficult to live with and supervise. When she was in her twenties, her father arranged for her to have an operation on her brain to improve her mental condition. But the operation left her completely disabled. Her family later sent her to a care center where she lived until her death in two thousand five. FAITH LAPIDUS: In the past, mental disability was generally treated as a shameful and hopeless disease. Many families secretly sent their disabled children to grow up in institutions. And, there were almost no community activities, resources or jobs for the mentally disabled. They were shut away with little respect and few civil rights. Eunice Shriver changed this. She showed the world that the mentally disabled could be useful citizens enjoying rich lives. BOB DOUGHTY: Eunice Mary Kennedy was born in Brookline, Massachusetts in nineteen twenty-one. She was the fifth of nine children born to the Irish Catholic family of Joseph and Rose Kennedy. Her grandfather was John Fitzgerald who served as mayor of Boston, Massachusetts and as a lawmaker. Eunice’s father was a wealthy businessman with powerful connections. The Kennedys raised their children to be highly intelligent and highly competitive. FAITH LAPIDUS: Eunice Kennedy Shriver once said that her father’s advice to his children was to win. He said that coming in second or third did not count, but one had to win, win, win. Mister Kennedy also told his friends that his sons would one day run for president. And, he was right. John F. Kennedy became president in nineteen sixty-one and served until his murder two years later. Robert Kennedy, a senator, ran for president in nineteen sixty-eight and was killed that same year. Edward Kennedy never won the presidency, but became a long- serving and important member of the United States Senate. BOB DOUGHTY: Eunice Shriver also carried on the family tradition of public service. She graduated in nineteen forty-three with a sociology degree from Stanford University in California. She worked for different organizations as a social worker before working for her family’s foundation. Over the years, she also worked for the political campaigns of her brothers, John, Robert and Edward. In nineteen fifty-three, she married R. Sargent Shriver. They had five children: Robert, Maria, Timothy, Mark and Anthony. FAITH LAPIDUS: Under the administration of John F. Kennedy, Eunice Shriver continued her work for her foundation. She influenced her brother to create a committee to study developmental disabilities. This effort led to the creation of the National Institute of Child Health and Human Development at the National Institutes of Health. In nineteen sixty-two, Ms. Shriver published an important article in the Saturday Evening Post called “Hope for Retarded Children.” She wrote openly about her sister Rosemary’s condition. For years, this had been a closely guarded family secret. Eunice Shriver used Rosemary as an example of how not to treat people with disabilities. Instead, she said people with mental disabilities needed to be treated as useful citizens and given special education and training. She said family members of disabled people had few resources for community support or medical help. She gave examples of parents who struggled to make a better life for their disabled children. BOB DOUGHTY: Ms. Shriver also opened a summer camp that was free of cost for mentally retarded children. The idea for it came when a mother told her that there were no summer camps where she could send her disabled child. So, Eunice Shriver did something about it. She started Camp Shriver at her home in Maryland to give disabled children a fun summer program filled with physical activities. Non-disabled children were also welcome to join the camp. She made sure there were a large number of workers to give the necessary attention to all the kids. And, she asked students from private schools to volunteer at the camp as helpers. Ms. Shriver was directly involved in all parts of the camp. She would often swim and play ball with the children. EUNICE KENNEDY SHRIVER: "Don't keep them away from something that can change their lives and give them a new vision and give their parents a new vision of them, just because they don't want someone in the community to say, 'oh, your child is special.'" 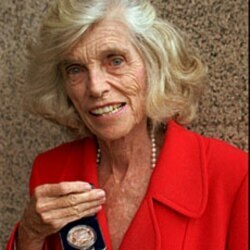 FAITH LAPIDUS: In nineteen sixty-eight, Eunice Shriver organized the first Special Olympics in Chicago, Illinois. FAITH LAPIDUS: About one thousand competitors from twenty-six states and Canada took part in the event. They competed in running, swimming and hockey. The idea of permitting mentally disabled people to compete in sports was revolutionary at the time. Before, people with special needs were often prevented from physical activity out of concern that they would hurt themselves or be unable to compete. Ms. Shriver said that the Special Olympics proved a very important fact: that exceptional children with mental retardation can be exceptional athletes. Today, the Special Olympics has grown to include about three million athletes in more than one hundred fifty countries. EUNICE KENNEDY SHRIVER: "Let us not forget that we have miles to go to overturn the prejudice and oppression facing the world's one hundred eighty million citizens with intellectual disabilities." BOB DOUGHTY: Eunice Kennedy Shriver continued to work for the disabled in other ways. She created an organization called Community of Caring. It works to reduce teenage pregnancies and educate students about creating caring and respectful communities. Ms. Shriver received many awards for her work. These include the French Legion of Honor and the Presidential Medal of Freedom, America’s highest civilian honor. Eunice Kennedy Shriver died in August of two thousand nine after a series of strokes. Her daughter’s husband, California Governor Arnold Schwarzenegger, said that she was the light of the family. And he said her pioneering work for social and scientific improvements changed the lives of millions of developmentally disabled people all over the world. FAITH LAPIDUS: This program was written and produced by Dana Demange. For transcripts, mp3s and podcasts of our shows, go to voaspecialenglish.com. I’m Faith Lapidus. BOB DOUGHTY: And I’m Bob Doughty. Join us again next week for People in America in VOA Special English.